Geology Field Trips: Geology Rocks! What happens when you add three days, thirty miles of river, great friends, exceptional food, and some of the most breathtaking country in the world? You get a whitewater rafting trip! Boo-Ya! But not just any river trip, this river trip is classified by three things: geology that even a dummy can appreciate (trust us, we did), phenomenal memories, and food that puts even Wendy’s to shame! By far one of the most remarkable geological marvels on this trip was Split Mountain. This was one formation that looked amazing even before you knew what you were looking at, and the story behind it is so unique it is literally world-renowned. The rock layers that compose the Uinta Mountains underwent radical changes throughout their history. Millions of years of deposition, erosion, folding, and faulting shaped the mountain into what it is today. Split Mountain's defining feature is the glimpse it offers into the extensive folding of the rock layers. About 60 million years ago the uplift of the Uintas formed folds called synclines and anticlines. 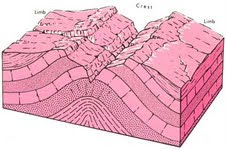 The Uintas Mountains were eroded away and covered by a younger rock layer that was not folded. The Green River established its meandering course on this layer Then, about 10 million years ago, geological uplift steadily raised the folded layers of rock into the Green’s path. Through this process, known as superimposed drainage, the Green River eventually carved its way right through the anticline and exposed layers of rock millions of years older. It is this rare phenomenon that makes Split Mountain is one of the world's most prominent examples of these slicing lacerations through geological history. One of the greatest memories we all came home with occurred at the Pot Creek campsite on our first night on the river. Years of deposition from the fluxuating river levels had created a really comfortable campsite—fully equipped with a downy soft beach that served as the ideal location for beach volleyball, sand art, and turning our freshman comrade into a total sand babe. This beach was an exceptional part of the river trip. Last, but certainly not least, was our guides contribution to the adventure. As you can imagine, managing over twenty teenage youth and their physical and emotional luggage confined to four seven foot by eighteen foot rafts can be quite a task, but despite it all, our guides consistently cranked out muy delicioso gourmet food. From boiling hot chocolate, to shore-side salads, a distended belly was a commonplace on this trip! In addition to the food, they were highly sociable and engaged themselves in our conversations. A special thanks to you Jordan (Raft Goddess), Tilt (Pancake God), Pat (Muffin God), and Ferg (Fergalicious)! You made the trip amazing! That was interesting.I like your quality that you put into your post.